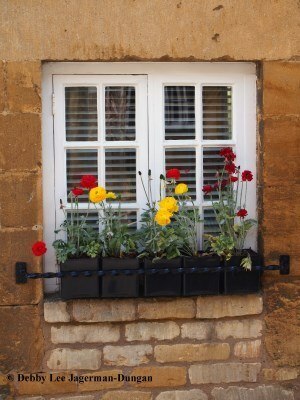 What my husband and I loved during our 12 days of walking in the Cotswolds was the quintessential contrasting and complementary colors of the flowers and plants that literally grow on and climb the walls of the honey- and golden-colored “Cotswold Stone” of the buildings. 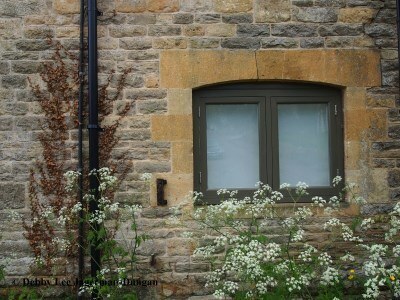 This stone, a Jurassic limestone rich in fossils, is used for houses, barns, stone walls, and churches. 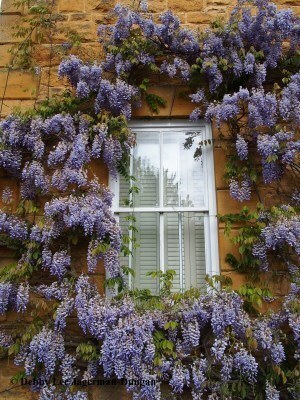 The flowers and plants that decorate the walls include purple wisteria, red and yellow roses, pink tulips, peach and white colored flowers, green foliage, and more, or any combination thereof. The Cotswolds is a region in England that is designated as an “Area of Outstanding Natural Beauty.” The Cotswolds contain 3,000 miles of public footpaths and roads, trails and tracks, that take you through farmland and pastures, fields and crops, rolling hills and valleys, open grasslands and gardens, forests and huge flowering trees, parks, nature reserves, wildflowers, and rivers and streams. Passing through gates, kissing gates, and stiles, you wander through timeless villages, small hamlets, and medieval market towns, sprinkled with historical churches. The pictures in my book are divided into three sections. 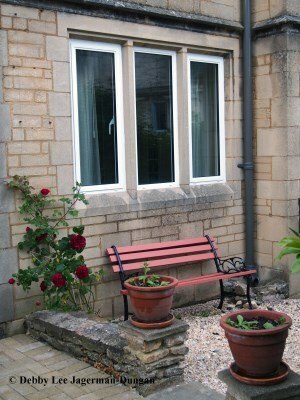 The first section contains photos of windows and doors, along with the harmonizing flowers and stone, of homes and buildings in the Cotswolds. Samples from this first section are shown in this blog. 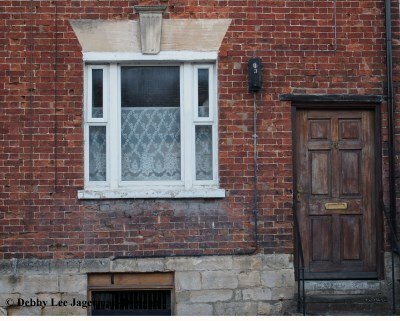 My next blog contains samples from the other two sections of my book, interior and exterior windows and doors of churches. 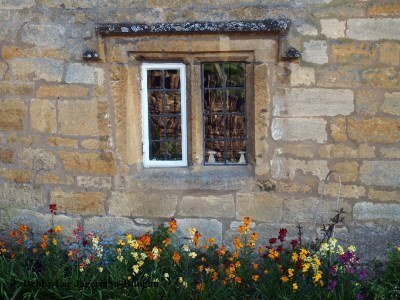 Throughout the book, pictures may also contain no flowers at all, just showing the “Cotswold Stone.” Pictures are also of other themes, such as objects displayed in windows, benches or chairs, red telephone or mail boxes, watering cans or milk jugs, horseshoes, candles, or white picket fences. And more. 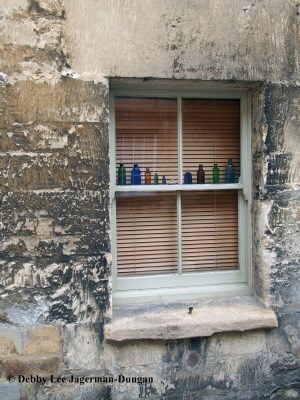 With over 375 photographs in 192 unnumbered pages, my third travel photography book is my representation of the Cotswolds as seen through its windows and doors, and will take you on a journey through the beautiful and timeless Cotswolds through its windows and doors. 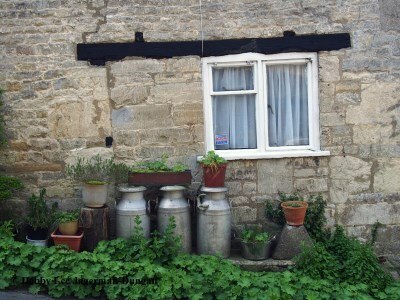 For other blogs from our Cotswolds travels, please visit my Cotswolds England category. 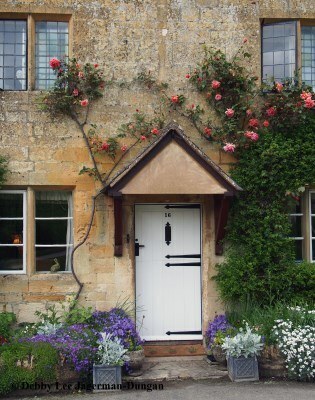 This entry was posted in Cotswolds England, My Photography Books, Windows and Doors and tagged Cotswolds England, My Photography Books, Windows and Doors by debbysdepartures. Bookmark the permalink.